There are plenty of articles and resources on what needs to happen in order to be happy & healthy. The hard part is figuring out what works for you (not everything works for everyone) and then sticking to the process. Yes, it is a process to be happy & healthy. Just like it is a process to not be. There are not bad or good things in life, there are only bad thoughts and good thoughts about things in life. 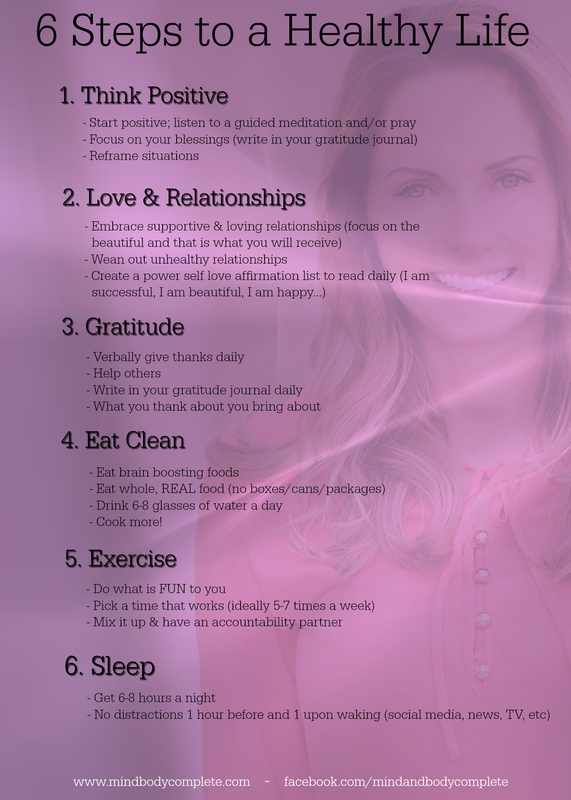 In my humble opinion, there are 6 steps to creating a healthy life. You may find there are more for you- and that is fabulous. I don’t believe there are less. Everyone says they want to be healthy and happy- but it is those that truly DECIDE to be that will be. That decision will lead to actions in order to transform your belief system. Once your belief system is transformed- you are unstoppable in anything you are set to accomplish including health, wealth & love.